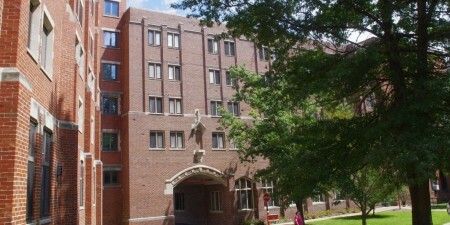 Designed by renowned architect Philip Johnson, Havey Hall houses 117 students and a residence life professional. 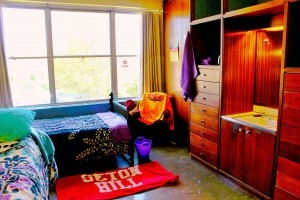 All rooms in Havey Hall are double-occupancy with the exception of a few three-person suites and two four-person suites. The ground floor of Havey Hall contains laundry facilities and a large lounge featuring kitchen facilities, a big-screen TV and a pool table. Student mailboxes are also located on the ground floor. Seven resident assistants live in Havey Hall. 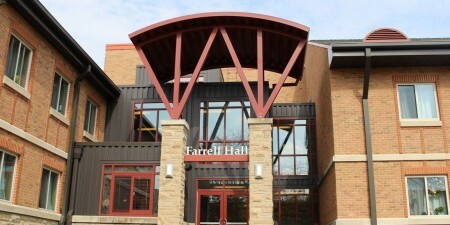 Havey Hall is on Seton Hill's main hilltop campus. Furniture in a double-occupancy room includes: 2 desks with chairs, 2 beds with mattresses, 2 closets, 2 dressers, 2 sets of shelves & 1 sink. Furniture in a triple-occupancy suite includes: 3 desks with chairs, 3 beds with mattresses, a wardrobe, 3 dressers, and its own bathroom/shower facilities. 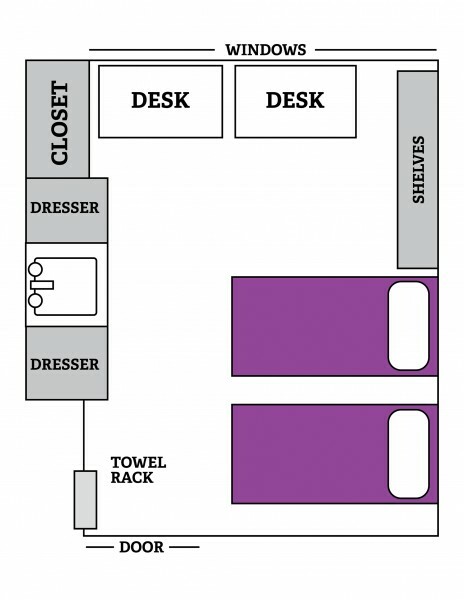 Furniture in a four-person suite includes: 4 desks with chairs, 4 beds with mattresses, wardrobes, and dressers. Closet dimensions: 23" x 23" x 67"
Drawer dimensions: 21" x 21" x 16"
Storage dimensions: 23" x 23" x 24"
Window dimensions: 136" x 68"
Desk dimensions: approximately 24" x 42" x 30"
The ground floor of Havey Hall contains laundry facilities and a large lounge, featuring kitchen and recreational facilities and a big screen TV. Student ID Card security access. Resident Assistants available for safety, comfort, and community building on each floor. To contact the Office of Residence Life, call (724) 838-4260 (between the hours of 8 a.m. - 5 p.m.). To contact Residence Life after office hours, please call Campus Police at (724) 830-4999.